used it. Rocky & His Friends, which aired on ABC between 1959 and '61, was both a better show than its earlier counterpart, and a better-known one. Today, it's best known as The Bullwinkle Show, which was its title when it was picked up for NBC's 1961-64 prime time schedule. The formula was simple. Rocky the Flying Squirrel (aka Rocket J. Squirrel) and his buddy, Bullwinkle J. Moose, repeatedly got involved in outlandishly silly adventures, full of cliffhangers and slam-bang action, and the adventures all had the same pair of bad guys — Boris Badenov and Natasha Fatale. That took care of two 3.5-minute segments per half-hour show. The rest consisted of such series as Fractured Fairy Tales, Peabody's Improbable History, Aesop & Son and Dudley Do-Right of the Mounties. Verbal interplay is what made this series shine. Voice actors June Foray (Tweety Bird's Granny), Bill Scott (George of the Jungle), and Paul Frees (Ludwig von Drake) in the major roles (Rocky/Natasha, Bullwinkle, and Boris, respectively); and Hans Conried, Daws Butler, William Conrad, Charles Ruggles, and Edward Everett Horton in the minor ones, brought the clever and sometimes slyly subversive scripts to life. And it's a good thing something did, because the animation was pretty dead. It was exported to Mexico's Gamma Productions (which later did such U.S. series as King Leonardo), and was so limited, the series was compared to "illustrated radio". Budgets were low, and quality control virtually nonexistent. This may have contributed to the fact that the show never did generate the size audience that advertisers like — but probably not, because low production values were endemic in television animation. It's more likely that a majority simply preferred humor along more conventional lines. The audience may not have been very large, but those who did like it, liked it a lot; and the enthusiasm of those fans has kept the show, under one name or another, on the air ever since. 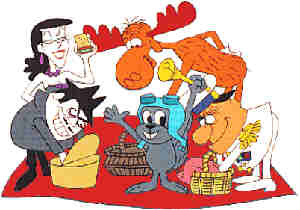 As Bullwinkle, it aired on NBC 1961-62, and again on ABC 1964-72. It was re-packaged for Saturday mornings in the mid-1980s, and has been syndicated to local stations in between. As a syndicated show, it usually runs in odd, out-of-the-way hours. A 1992 live-action feature film, Boris and Natasha, also failed to achieve mega-hit status. Rocky & Bullwinkle never made it big in comics, either. They briefly supported a newspaper strip in the early 1960s, and have been published sporadically in comic books by several different publishers. Their most recent adaptation to that medium was done by Marvel Comics, which published nine issues between 1987 and '89. Only the cartoons, however, have sparked any real interest among aficionados. They remain as popular as they ever were — sparking enthusiasm in some, but scarcely being noticed by most.